Heat a medium size soup pot over medium high heat. Add the EVOO, 2 turns of the pan, then add the sausage to the pot and brown and crumble it. Add the garlic, onion and mushrooms. Cook for a few minutes, then add the carrots, lentils, potato, salt and pepper, bay leaf, paprika or substitute mixture and rosemary (the leaves will fall from the stems as the stoup cooks). Add the tomatoes and stock and cover the pot, then raise the heat to high and bring to a boil. Uncover the pot and place the heat back a bit but keep the stoup at a good rolling boil. Cook for 15 minutes until the lentils and potatoes are tender. Wilt in the greens in small bunches, remove the rosemary stems and turn off the heat. Let stand for 5 minutes. Serve in shallow bowls with bread and butter to mop up the stoup. Reheat the leftovers, thinning with stock or water. In Recipes-list.com we have selected the most viewed recipes from category - uncategorized . Enjoy the best recipes specially selected for you! 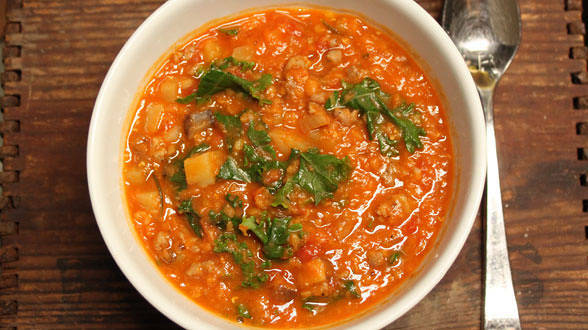 Hungarian Hot Sausage and Lentil Stoup is the right choice that will satisfy all your claims.